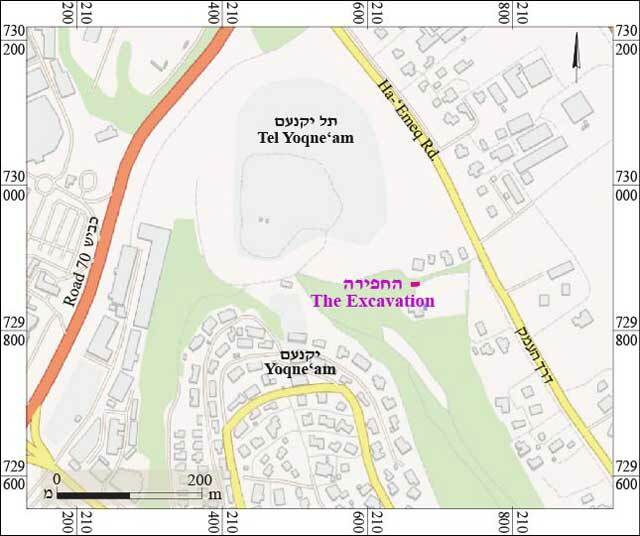 In March 2014, a salvage excavation was conducted at the foot of Tel Yoqneʽam, in the moshava (Permit No. A-7081; map ref. 21650-700/729850-75; Fig. 1), prior to the construction of a private residence. The excavation, undertaken on behalf of the Israel Antiquities Authority and financed by the contractor, Mr. J. Levy, was directed by N. Feig (photography), with the assistance of A. Lavan (administration), R. Mishayev and M. Kahan (surveying), N. Zak (drafting), A. Shapiro (GPS), H. Tahan-Rosen (pottery drawing) and laborers from Kafr Manda. Tel Yoqneʽam (40 dunams), which is identified with the biblical site of Yoqneʽam, was surveyed by the British Survey of Western Palestine (Conder and Kitchener 1882:69–70) at the end of the nineteenth century and the Survey of Israel (Raban 1982:12–14). In decade-long excavations conducted on Tel Yoqneʽam by an expedition of the Institute of Archaeology of the Hebrew University, 27 settlement layers were exposed, which included an uninterrupted sequence of architectural remains and pottery dating from the Early Bronze Age I to the Ottoman period (Ben-Tor, Avissar and Portugali 1996; Ben-Tor, Zarzecki-Peleg and Cohen-Anidjar 2005). Among the most prominent finds in these excavations are the massive fortifications of the city from the tenth–eighth centuries BCE and the remains of the fortified Crusader town Qaimon (twelfth–thirteenth centuries CE). Two squares (A, B; Fig. 2) were opened at the southern edge of the mound’s eastern slope. 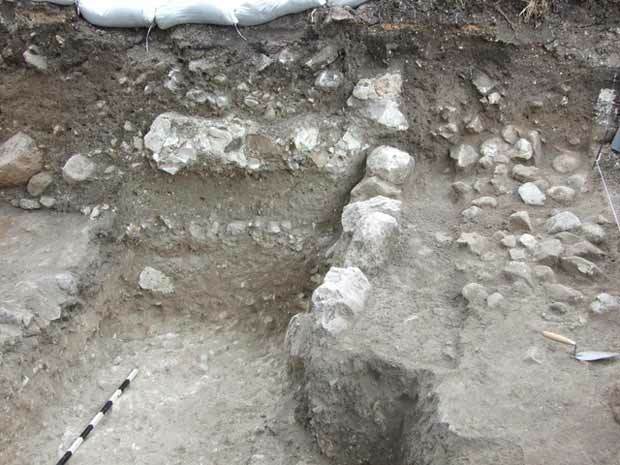 The remains uncovered in the excavation included habitation levels dating to the Iron Age II, a concentration of pottery sherds from the Early Roman period, a habitation level and installation from the Byzantine and Early Islamic periods and remains of a wall that postdate the Islamic period. Stratum III. Two deposition phases were discovered. In the bottom of the stratum (Phase IIIb), a light-colored layer of tamped soil was exposed, set directly on the bedrock (L606; Fig. 3) that slopes from south to north. 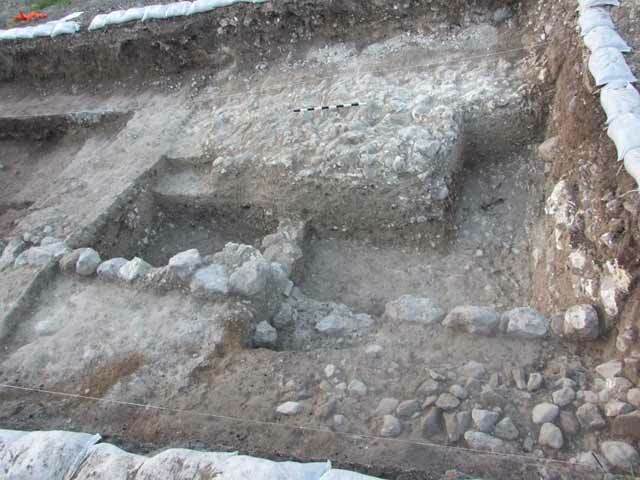 Jars dating to Iron II were discovered. Above the light-colored layer was a layer of soil mixed with small stones (Phase IIIa; L604) on which jars, cooking pots and several fragments of kraters were discovered, also dating to Iron II. Stratum II. The base of an installation (W62) of unclear shape was visible in the western balk of the square. A Byzantine pottery sherd was found inside the installation. Stratum I. A wall (W61; length 6.5 m) aligned east–west was exposed, built of a single row of stones that survived to a height of two courses. The wall severed Installation 62 of Stratum II and penetrated the accumulations of Stratum IIIa. A level of randomly arranged, different-sized stones (L602) was exposed south of the wall. The top of the stone level was at the same elevation as the top of the wall (Fig. 4); however, it is unclear if the stone level abutted it. A level consisting of small stones (L607) was uncovered northwest of W61. The presence of a modern stone clearance heap hampered any possibility of determining if this stone level abutted the wall. Pottery vessels dating to Iron II and the Early Roman and Byzantine–Early Islamic periods were found on top of Stone Surface 602 and adjacent to the wall; it seems that the origin of this group of mixed vessels is in the settlement remains located at the top of the mound. Stratum III. The continuation of the light-colored layer exposed in Sq A (L606) was also discovered directly on the bedrock in Sq B (L608); however, the continuation of the overlying layer of soil and stones was not detected here. Several pottery vessels were found in the light-colored layer: two fragments of Iron II cooking-pot rims (not illustrated) and one fragment of an imported bowl from the Byzantine period. Stratum II was a thick burnt layer (L605; 0.5 m), which was exposed in each of the squares (Fig. 5). Mainly vessels dating to the end of the Byzantine–beginning of the Early Islamic periods (sixth–eighth centuries CE) were discovered. Most of them bore traces of burning, indicative of an immense conflagration. The pottery vessels from Iron II (ninth–eighth centuries BCE) were discovered in the light-colored layer (IIIb); one jar, which originated in the burnt layer, had penetrated into the light-colored layer in Sq B. The assemblage included a krater with a thickened rim (Fig. 6:1), characteristic of Iron II assemblages; cooking pots with a stepped rim (Fig. 6:2, 3) dating to the eighth century BCE and appearing in Tel Hazor, Stratum VI (Bonfil and Greenberg 1997: Fig. II.37:5) and Tel Qiri, Strata VI–VIII (Hunt 1987:153, CP Group III:2); a large, neck-less storage jar (Fig. 6:4), carinated at the shoulder, usually with a plain or square rim (designated Type IV in Stratum VI at nearby Tel Qiri); smaller short-necked storage jars (Fig. 6:5, 6), prevalent in Stratum V of Area A at Tel Hazor and dated to the mid-eighth century BCE; and a jar (Fig. 6:7) with a thickened rim that appears in the ninth century and continues in the eighth century BCE. The pottery attributed to the Early Roman period includes a red-burnished ESA bowl with a stamped decoration (Fig. 7:1); a fragment of a jug (Fig. 7:2) decorated with brown paint and made of well-levigated light-colored clay; and a jar (Fig. 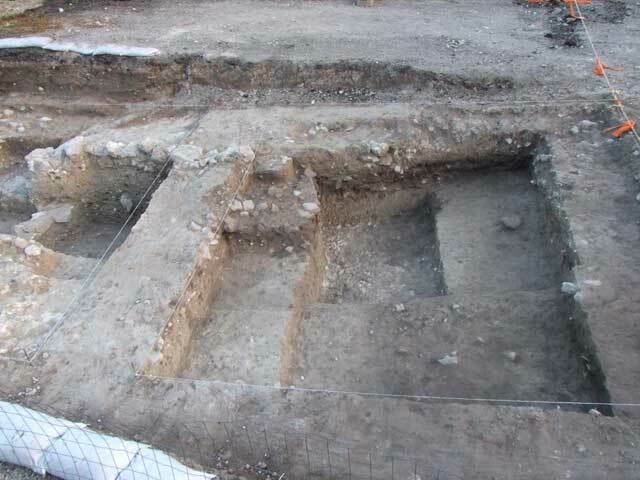 7:3) characteristic of settlement sites and tombs in the Galilee and the Jerusalem region dated to the mid-first century BCE–mid-first century CE. 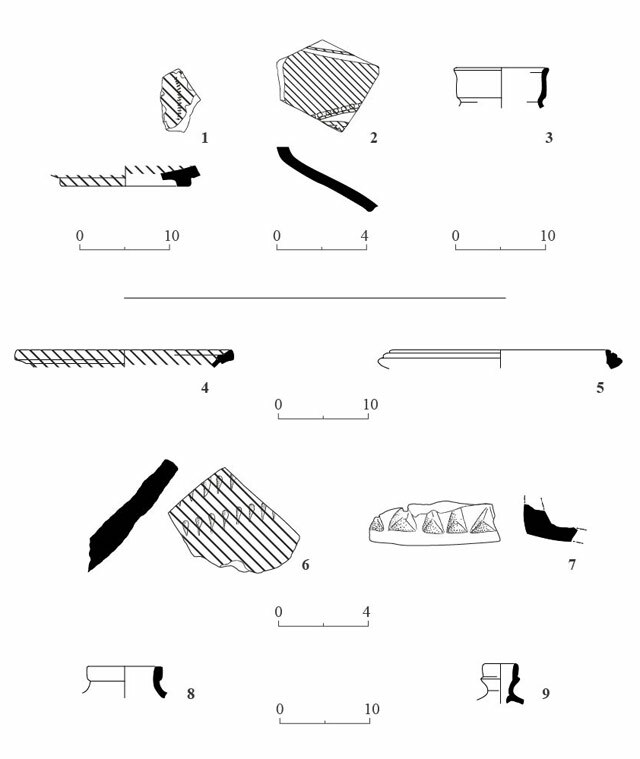 The last two sherds were found in Stratum II. The pottery that dates to the end of the Byzantine–beginning of the Early Islamic periods (sixth–eighth centuries CE) was found in the burnt layer. Several imported red-burnished bowls (Late Roman Ware) that date to the sixth–seventh centuries CE were discovered: a Type 10 LRC bowl; Type 7 and Type 10 CRS bowls (Fig. 7:5, 6 respectively; Hayes 1972: Fig. 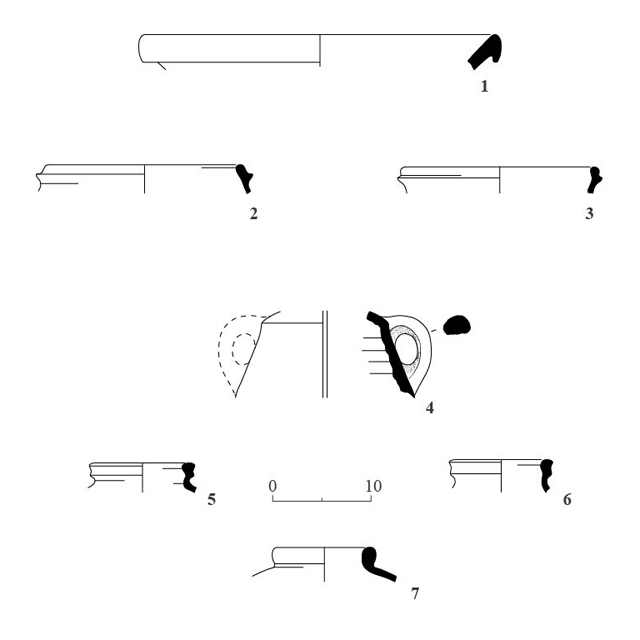 71:1, 2; Fig. 81; Fig. 82:1); a bowl adorned with a window-like base (Fig. 7:7), which dates to the seventh century CE—kerbschnitt ware, characteristic of the Umayyad period and continuing into the Abbasid period, examples of which were also exposed in ceramic assemblages at the top of the tell; a gray bag-shaped jar (Fig. 7:8) with a square rim known from assemblages from the sixth–seventh centuries CE at Caesarea, in the Jezreel Valley and at sites in the Galilee (Oren-Paskal 2008:51); and a flask (Fig. 7:9) known from assemblages in Tiberias and Bet She’an, where it is dated to the seventh–mid-eighth centuries CE. The ‘golden age’ of Tel Yoqneʽam was without doubt in Iron II, as evidenced by the finds on the mound; the current excavation shows some activity that also took place on the eastern slopes of the tell. During the Byzantine and the Early Islamic periods most of the settlement was situated in the area of Yoqneʽam ʽIllit, but the installation, the burnt layer, the jars and the cooking pots may attest to industrial activity at the foot of the tell. These may be the first signs of a return to the top of the mound, when it was an open settlement in the early eighth century CE. Ben-Tor A., Avissar M. and Portugali Y. 1996. Yoqneʽam I: The Late Periods (Qedem Reports 3). Jerusalem. Ben-Tor A., Zarzecki-Peleg A. and Cohen-Anidjar S. 2005. Yoqneʽam II: The Iron Age and the Persian Period: Final Report of the Archaeological Excavations (1977–1988) (Qedem Reports 6). Jerusalem. Bonfil R. and Greenberg R. 1997. Area A. In A. Ben-Tor and R. Bonfil eds. Hazor V. Jerusalem. Conder C.R and Kitchener R.E. 1882. The Survey of Western Palestine II. London. Hayes J.W. 1972. Late Roman Pottery. London. Hunt M. 1987. The Pottery. In A. Ben-Tor and Y. Portugali. Tell Qiri—A Village in the Jezreel Valley: Report of the Archaeological Excavations 1975–1977 (Qedem 24). Jerusalem. Pp. 139–223. Oren-Paskal M. 2008. Amphoras from the Abandonment Layer in Area LL (L1242, L1335). In K.G. Holum, J.A. Stabler and E.G. 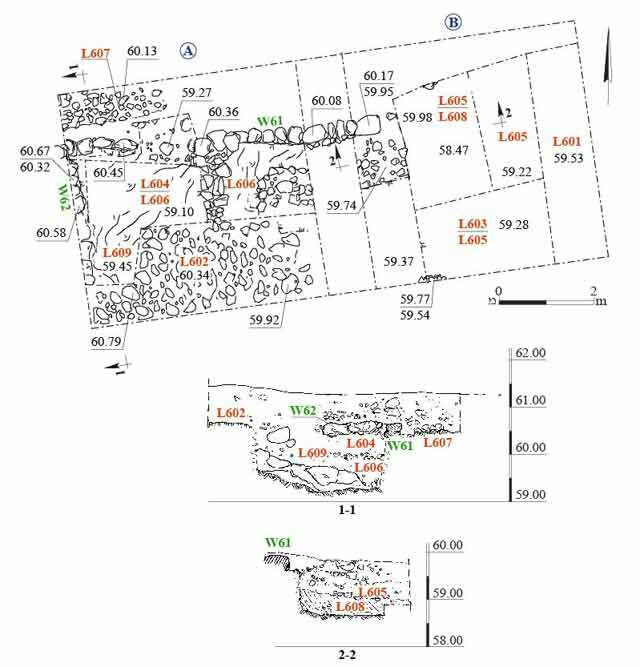 Reinhardt eds.Caesarea Reports and Studies: Excavations 1995–2007 Within the Old City and the Ancient Harbor. (BAR Int. S. 1784). Oxford. Pp. 49–58. Raban A. 1982. Map of Nahalal (28). (Archaeological Survey of Israel). Jerusalem. 3. Stratum III, the light-colored layer on the bedrock surface, looking west. 4. Stratum I, Wall 61 and the layer of stones (L602), looking south. 5. Stratum II, a burnt layer (L605), looking north. 7. Pottery: Roman and Byzantine periods.